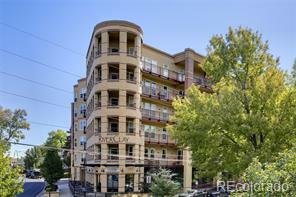 Directly across from Jefferson Park, this corner unit has the largest floorplan in RiverClay. The views of Jeff Park's greenery are outstanding, and rather unique for a Denver condo. Two outdoor decks encompass 400+ sq ft of amenity-rich living space. The open kitchen, dining, living areas are drenched with natural light, plants love it! Entertainers/cooks will appreciate the flow of the main living area. The master bath was recently updated, the master bedroom has direct access to the deck. The office could be a 3rd non-conforming bedroom, or a great filex space. Updates include wide plank Hickory flooring, wool carpet, kitchen counter/backsplash, LED lights. RiverClay is Sliver LEED certified, 2 solar panels for Unit 200 keep energy costs down. Two adjacent parking spaces on the 1st level. Great storage in the unit, plus a storage locker on the lower level. Jeff Park offers walkability and location convenience. Visit https://bit. ly/2yyj5R4 for an interactive scan.